Leonardo da Vinci (15 April 1452 – 2 May 1519) was an Italian man who lived in the time of the Renaissance. He is famous for his paintings, but he was also a scientist, mathematician, engineer, inventor, anatomist, sculptor, architect, botanist, musician, and a writer. Leonardo wanted to know everything about nature. He wanted to know how everything worked. He was very good at studying, designing and making all sorts of interesting things. Many people think that Leonardo was one of the greatest painters of all time. Other people think that he was the most talented person ever to have lived. The art historian Helen Gardner said that no-one has ever been quite like him because he was interested in so many things that he seems to have had the mind of a giant, and yet what he was like as a person is still a mystery. Leonardo was born at Vinci which is a small town near Florence, Italy. He was trained to be an artist by the sculptor and painter Verrocchio. He spent most of his life working for rich Italian noblemen. In his last years, he lived in a beautiful home given to him by the King of France. A simple video presentation of Leonardo da Vinci. Leonardo's earliest known drawing, the Arno Valley, 1473. It is in the Uffizi Gallery. Leonardo was born on 15 April 1452, in the Tuscan hill town of Vinci, in the valley of the Arno River. His grandfather, Antonio da Vinci, wrote down the details of the birth. Leonardo's parents were not married. His father was a Notary, Ser Piero da Vinci. His mother, Caterina, was a servant. She may have been a slave from the Middle East. or from China. His father later on took custody of Leonardo and his mother remarried and had 5 more children. Leonardo's full name was "Leonardo di ser Piero da Vinci", which means "Leonardo, the son of Messer (Mister) Pierdaom Vinci". Leonardo spent his first five years living in a farm house with his mother. Then he lived at Vinci with his father, his father's new wife Albiera, his grandparents and uncle, Francesco. When Leonardo grew up, he only wrote down two memories from his childhood. He remembered that when he was lying outside in his cradle a large bird flew from the sky and hovered over him. Its tail feathers brushed his face. Leonardo's other important memory was how he found a cave while exploring in the mountains. He was terrified that some great monster might be hiding there. But he was also very excited and wanted to find out what was inside. Leonardo started painting while he was still a boy. Giorgio Vasari wrote about Leonardo's life shortly after his death. He tells many interesting stories about how clever Leonardo was. He says that Leonardo painted a round wooden shield with a picture of snakes spitting fire. Messer Piero took his son's painting to Florence and sold it to an art dealer. In 1466, when Leonardo was fourteen, his father took him to Florence, to be an apprentice to the artist Verrocchio. Florence was a very exciting place for a young person who wanted to be an artist. Many famous artists had lived in Florence, starting with Cimabue and Giotto in the 1200s. Everywhere a person looked there were famous and beautiful artworks. The huge cathedral had an enormous new dome. The church of St John had doors that gleamed with gold and were said to be the most beautiful doors in the world. Another church had statues all around it by the most famous sculptors, including one by Leonardo's teacher Verrocchio. If an artist was lucky, they would find a rich patron who would buy lots of their paintings. The richest family in Florence were the Medici. They had built themselves the finest palace in Florence, and liked buying paintings, statues and other beautiful things. They were also interested in the study of literature and philosophy. Many young artists hoped to get work from the Medici and their friends. Verrocchio had a big workshop that was one of the busiest in Florence. Leonardo was learning to be an artist, so he had to learn drawing, painting, sculpting and model making. While he was at the workshop, he was able to learn all sorts of other useful skills: chemistry, metallurgy, metal working, plaster casting, leather working, mechanics and carpentry. Leonardo was not the only young painter at Verrocchio's workshop. Many other painters were trained there, or often visited. Some of them later became famous: Ghirlandaio, Perugino and Botticelli. These artists were all just a few years older than Leonardo. Giorgio Vasari tells an interesting story from this time of Leonardo's life. 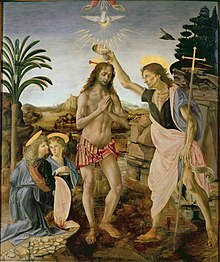 Verrocchio was painting a large picture of the Baptism of Christ. He gave Leonardo the job of painting one of the angels holding Jesus' robe on the left side of the picture. Vasari said that Leonardo painted the angel so beautifully that Verrocchio put down his brush and never painted again. When the painting is examined closely it is possible to see that many other parts of the picture, such as the rocks, the brown stream and the background may have been painted by Leonardo as well. Verrocchio made a bronze statue of David at this time. It is believed that he used Leonardo as his model. In about 1472, when he was twenty, Leonardo joined the Guild of St Luke, an organisation of artists and doctors of medicine. Even after his father set him up in his own workshop, Leonardo still enjoyed working at Verrocchio's workshop. Leonardo's earliest known work is a drawing in pen and ink of the Arno River valley. It has the date 5 August 1473. It is now in the Uffizi Gallery. When Vasari writes about Leonardo, he uses words like "noble", "generous", "graceful" and "beautiful". Vasari tells us that as an adult Leonardo was a tall handsome man. He was so strong that he could bend horseshoes with his bare hands. His voice was so beautiful that it charmed everyone that heard it. Almost everyone wanted to be his friend. He loved animals, was a vegetarian and would buy birds at the market and set them free. Very little is known about Leonardo's life and work between 1472 and 1481. He was probably busy in Florence. In 1478, he had an important commission to paint an altarpiece for the Monks of San Donato a Scopeto. The painting was to be the Adoration of the Magi (The Three Wise Men). The painting was never finished because Leonardo was sent away to Milan. Leonardo was a very talented musician. In 1482, he made a silver lyre (a musical instrument) in the shape of a horse's head. At that time there was a new ruler in the city of Milan, in the north of Italy. Duke Ludovico il Moro was making other rulers nervous. Lorenzo Medici sent Leonardo to Milan as an ambassador. Lorenzo de' Medici wanted Leonardo to give Ludovico the lyre as a present from him. Leonardo wrote a letter to the Duke of Milan, telling him about all the clever and useful things that he could do, like making war machines. He wrote in the letter that he could "also paint". Leonardo did not know at the time that it was for painting that he would be mostly remembered. Leonardo stayed in Milan and worked for the Duke between 1482 and 1499. Part of his work was to design festivals and carnival processions. In Leonardo's note books are drawings of theatre costumes, amazing helmets and scenes that might be for the theatre. Virgin of the Rocks, Louvre, possibly 1505–1508. Leonardo, like most other well-known artists of his time, had servants, young students and older assistants in his workshop. One of his young students was a boy whose name was Gian Giacomo Caprotti da Oreno. He was a handsome boy with beautiful long golden curls. He looked perfect as an artist's model for an angel. But he was such a difficult and dishonest boy that Leonardo called him "Salai" or "Salaino" which means "the little devil". Leonardo wrote in his notebook that Salai was very greedy, that he was a liar and that he had stolen things from the house at least five times. 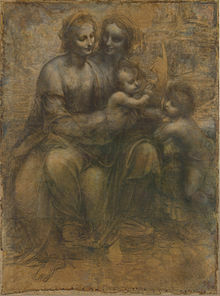 Salai stayed in Leonardo's household for thirty years as a pupil and a servant. Leonardo's most important work for Duke Ludovico was to make a huge statue of the previous ruler, Francesco Sforza, on horseback. He started with the horse. After studying horses and drawing designs, he made a huge horse of clay. It was called the "Gran Cavallo". It was going to be cast in bronze. It was going to be the biggest bronze horse that had been made for more than a thousand years. Unfortunately, the bronze horse was never made. In 1494, Ludovico gave the bronze to be made into cannons because the French army was invading Milan. The huge clay horse was still standing when the French army invaded again in 1499. This time it was used for target practice and was completely destroyed. While Leonardo was working for Duke Ludovico, he had two important painting commissions. One was to do an oil painting to go in a big altarpiece for the Confraternity of the Immaculate Conception. Leonardo did the painting twice. He left one with the monks in Milan, and took the other painting to France where it is now in the Louvre Museum. The paintings are both called the Virgin of the Rocks. They show a scene of the Virgin Mary and the child Jesus in a rocky mysterious landscape. Mary and Jesus are meeting with John the Baptist. There is a story (which is not in the Bible but is part of Christian tradition) about how the baby John and the baby Jesus met on the road to Egypt. In this scene John is praying and the baby Jesus raises his hand to bless John. The paintings have a strange eerie light with soft deep shadows. In the background is a lake and mountains in the mist. No painting like this had ever been done before. The Last Supper (1498). Milan, Italy. Leonardo's other important painting in Milan is even more famous. It is the Last Supper. The painting shows the last meal shared by Jesus with his disciples, before his capture and death. Leonardo chose to paint the moment when Jesus has said "one of you will betray me". Leonardo tells the story of the surprise and upset that this caused to the twelve followers of Jesus. He tells the story through the actions and faces of the people in the painting. Some of them are talking, some of them have stood up, some are raising their hands in horror. The novelist Matteo Bandello saw Leonardo at work. Bandello wrote that on some days he would paint from morning till night without stopping to eat. Then for three or four days he would not paint at all. He would often just stand and look at the painting. Vasari said that the prior of the convent was very annoyed. He asked Ludovico to tell Leonardo to work faster. Vasari said that Leonardo was worried because he did not think that he could paint the face of Jesus well enough. Leonardo told the Duke that he might use the face of the prior as his model for Judas, the traitor. When it was finished, everyone that saw it said that the painting was a masterpiece. But Leonardo had not used proper fresco for the painting. He had used tempera over gesso, which is not usually used for wall painting. Soon the painting started to grow mold and flake off the wall. In a hundred years it was "completely ruined". Even though in some places the paint has fallen right off the wall, the painting is so popular that it is printed and copied more that any other religious painting in the world. In 1499, Ludovico il Moro was overthrown. Leonardo left Milan with his servant Salai and a friend, Luca Pacioli, who was a mathematician. They went to Venice. Leonardo worked as a military architect and engineer. Because Venice is a city on many islands, Leonardo tried to think of ways to defend the city from a naval attack. In 1500, Leonardo went back to Florence, taking his "household" of servants and apprentices with him. The monks from the monastery of The Holy Annunciation gave Leonardo a home and a large workshop. In 2005, some buildings which were used by the Department of Military Geography were being restored. The restorers discovered that part of the building was Leonardo's studio. Leonardo started work on a new painting. He drew a large "cartoon". (This means a drawing that is a plan for the painting.) The cartoon showed the Virgin Mary sitting on the knee of her mother, St Anne. Mary holds the baby Jesus in her arms. Jesus stretches out his hands to his young cousin John the Baptist. Vasari says that everyone was so amazed by the beautiful drawing that "men and women, young and old" came in large groups to see it "as if they were attending a great festival". The drawing is now in the National Gallery, London. Even though it is old and faded and is kept in a dark room, people go to the gallery to sit in front of it every day. Like many of Leonardo's projects, the painting was never done. In 1502 and 1503, Leonardo worked for Cesare Borgia, a powerful noble who was the son of Pope Alexander VI. Leonardo travelled around Italy with Borgia, as a military architect and engineer. Late in 1503, Leonardo returned to Florence. He rejoined the Guild of St Luke. He was given a very important commission. The Signoria (Town Council) of the City of Florence wanted two large frescos painted on the walls of the most important room of the Signoria Palace. Michelangelo was to paint The Battle of Cascina and Leonardo was to paint The Battle of Anghiari. Leonardo began the project by studying and drawing the faces of angry men and fighting horses. These drawings can still be seen in his notebooks. But unfortunately, this was to be another failure for Leonardo. When he painted the picture on the wall, instead of using fresco, he mixed the paints with oil. The paint would not dry. Leonardo lit some fires to dry it, and the painting melted. Peter Paul Rubens drew a copy of the middle part. After a time, the town council covered it up and got somebody else to paint the wall. Michelangelo did not finish his painting either, because the Pope called him to Rome. The reason why the painting is so famous is that it seems to be full of mystery. Mona Lisa's eyes look out at the viewer. But no-one can guess what she is thinking. Her eyes and her mouth seem to be smiling. This is very unusual in a portrait painting. Most people in portraits look very serious. It is hard to tell what Mona Lisa's exact expression is. When a person wants to read another person's feelings, they look at the corners of their mouth and eyes. But Leonardo has painted soft shadows in the corners of Mona Lisa's mouth and eyes, to disguise her expression. The soft shadows are also found on the sides of her face, her neck and hands. The way that Leonardo uses shadow is called "sfumato" (which is an Italian word for "smoke"). Vasari said that the picture was so beautifully painted that every other artist who looked at it thought that they could never paint so well. In 1506, Leonardo went back to Milan with his pupils, and lived in his own house in Porta Orientale. Some of the pupils became painters: Bernardino Luini, Giovanni Antonio Boltraffio and Marco D'Oggione. D'Oggione made several copies of the Last Supper. 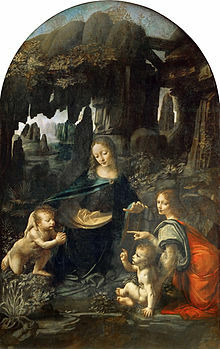 Luini made a copy of the Virgin of the Rocks. Boltraffio (and the others) painted many Madonna and Child pictures which can still be seen in art galleries and churches. One of pupils was a young nobleman called Count Francesco Melzi. Melzi never became a very good painter, but he loved Leonardo and stayed with him until the day he died. In September 1513 Leonardo went to Rome and lived there until 1516. He lived in the Vatican. The three greatest painters of the High Renaissance, Leonardo, Michelangelo and Raphael were all working in Rome at the same time. Even though their names are often said together as if they were friends, they were not. Leonardo at this time was in his sixties, Michelangelo was middle-aged. He was not friendly to either Leonardo or Raphael. Raphael was a very clever young painter who learnt a lot by looking at the pictures painted by Leonardo and Michelangelo. But neither of them was ever his teacher. In October 1515, King Francis I of France captured Milan. On December 19, there was a meeting of Francis I and Pope Leo X, in Bologna. Leonardo went to the meeting with Pope Leo. Leonardo made an amazing toy to entertain King Francis. It was a life-sized mechanical lion that could walk. It had doors in its chest which opened, and a bunch of lilies came out. Lilies were the royal symbol of the French Kings. In 1516, Francis I invited Leonardo to go to France with him. He gave Leonardo a beautiful house called Clos Lucé (sometimes called "Cloux"). It is near the king's palace, Chateau Amboise. Leonardo spent the last three years of his life at Clos Lucé, with his faithful friend and apprentice, Count Melzi. The king gave Leonardo a pension of 10,000 scudi. One of the last paintings that Leonardo did was a picture of John the Baptist. His model was Salai, with his beautiful long curling hair. When Leonardo was dying, he asked for a priest to come, so that he could make his confession and receive Holy Communion. Leonardo died at Clos Lucé, on May 2, 1519. King Francis had become a close friend. Vasari says that the King held Leonardo's head in his arms as he died. In his will, he asked that sixty beggars should follow his casket in procession. He was buried in the Chapel of the Chateau Amboise. Leonardo had never married and had no children of his own. In his will, he left his money, his books and most of his paintings to Count Melzi. Leonardo also remembered his other pupil Salai and his servant Battista di Vilussis, who each received half of Leonardo's vineyards near Milan. Leonardo's left to his serving woman a black cloak with a fur edge. 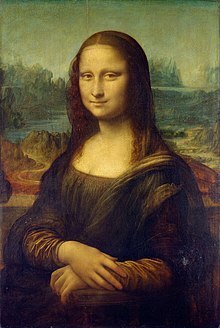 Salai was the owner of Leonardo's most famous oil painting, the Mona Lisa. He still owned it a few years later when he died, after fighting in a duel. King Francis said: "There had never been another man born in the world who knew as much as Leonardo, not so much about painting, sculpture and architecture, as that he was a very great philosopher." Leonardo did not paint very many pictures. But he drew hundreds of quick sketches, plans, maps and detailed drawings. This is the way that he recorded all the interesting things that he saw, studied and thought about. Some of Leonardo's drawings are "studies" for paintings. In these drawings Leonardo planned the things he was going to paint. Some studies are plans for whole paintings. One of these paintings is the large beautiful drawing of the Madonna and Child with St Anne and St John the Baptist that is now in the National Gallery, London. Many of the studies show "details" that Leonardo wanted to get just right. One study shows a very detailed perspective drawing of the ruined buildings in the background of the painting of the Magi. Other studies show hands, faces, drapery, plants, horses and babies. The earliest drawing by Leonardo that has a date on it, is a Landscape of the Arno Valley, 1473, which shows the river, the mountains, Montelupo Castle and the farmlands beyond it in great detail. Leonardo da Vinci studied the Flight of birds and tried to make a flying machine based on his discoveries. Leonardo studied things all his life. He did not go to university to study. He studied by looking at things in the world around him. He looked at things to see how they were made and how they worked. He drew the things that he saw and the discoveries that he made into his notebooks, and made notes about them. Many of his notebooks are now in museums. There are 13,000 pages of notes and drawings. Many of these are scientific studies. Leonardo's notebooks are hard to read because he wrote backwards in "mirror writing". Some people think that perhaps he was trying to keep his work secret. This is not true. Leonardo wrote (and sometimes drew) with his left hand. In those days pens were made from a quill (a large feather) that was cut with a pen-knife on the end. It is hard for a left-handed person to write with a quill in the ordinary way, but quite easy to write backwards. It is likely that Leonardo planned to publish the studies in his notebooks. He organized many pages carefully, with one study taking up the front and back of each page. 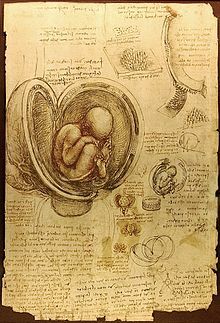 There is a page with drawings and writing about the human heart and a page about the womb and the fetus. One page shows drawings of the muscles of a shoulder and another page shows how an arm works. The notebooks were not published in Leonardo's lifetime. After he died, they were divided between different people who had known him. They are nearly all in museums or libraries such as Windsor Castle, the Louvre, and the British Library. The Biblioteca Ambrosiana (a library) in Milan has the twelve-volume Codex Atlanticus. The geology of the Earth, with its mountains, valleys, rivers and rocks. The anatomy of the human body with its skeleton, muscles, veins and internal organs. Leonardo was given dead bodies by a hospital. He "dissected" (cut up) thirty dead bodies and carefully drew many of the parts. His drawings of bones and muscles were to help other artists to paint the human body properly. The expressions on human faces. The flight of birds . The weather and its phenomena. The way that water flows. Light, shadows, mirrors and lenses. Perspective and the way to make things look near or far. The geometry of solid objects. He drew many careful pictures which were used by the mathematician Luca Pacioli in a book called De Divina Proportione. Many of the drawings and notes in Leonardo's notebooks are designs, plans and inventions. Costumes for parades, carnivals and theatre. These were probably for Duke Federico's court. They include armour, and a ferocious dragon. War machines such as an armour-plated tank, an enormous cross bow and a horrible horse-driven leg-chopper. None of these things were ever made in Leonardo's lifetime. Dams and canals for rivers. A wooden bridge that could be carried flat on wagons and unfolded and put together at the river. Flying things with wings that flapped, a helicopter, a parachute and a hang glider. One of Leonardo's servants was injured, trying out the hang glider. The parachute has been made and tested in modern times, and it does work. Churches and castles. It is possible that the Castle of Locarno, in the south of Switzerland was designed by Leonardo. No other building that he designed was built. Modern model of Leonardo's parachute. Modern model of a bridge designed by Leonardo. ↑ Theophilus On Divers Arts, translators:J.G.Hawthorne and C.S. Smith, University of Chicago Press, 1963; reprinted New York: Dover Publications 1979. This is a Medieval practical handbook of skills for the artisan, and includes a brief instruction for mixing oil paint. ↑ Cennino d’A. Cennini Il Libro dell’ Arte, ed. D. V. Thompson Jr. (1933) New Haven: Yale University Press. A practical handbook of painting written in the early 15th century. ↑ Rossi, Paolo (2001). The Birth of Modern Science. Blackwell Publishing. p. 33. ISBN 0631227113. ↑ "Leonardo's Letter to Ludovico Sforza". Leonardo-history. Retrieved 2007-09-28. ↑ Owen, Richard (2005-01-12). "Found: the studio where Leonardo met Mona Lisa". The Times. Retrieved 2008-02-22. ↑ "Leonardo's will". Leonardo-history. Retrieved 2007-09-28. ↑ Rossiter, Nick (2003-07-04). "Could this be the secret of her smile?". Telegraph.co.UK. Retrieved 2007-10-03. ↑ Windsor Castle, Royal Library, sheets RL 19073v-19074v and RL 19102 respectively. Liana Bortolon (1967). The life and times of Leonardo. Paul Hamlyn, London. ISBN 075251587X. Hugh Brigstoke (2001). The Oxford Companion to Western Art. USA: Oxford University Press. ISBN 0198662033. A.E. Popham (1946). The drawings of Leonardo da Vinci. Jonathan Cape. ISBN 0 224 60462 7. Jean Paul Richter (1970). The notebooks of Leonardo da Vinci. Dover. ISBN 0-486-22572-0. ISBN 0-486-22573-9. 2 volumes. A reprint of the original 1883 edition. "Leonardo da Vinci" in the 1913 Catholic Encyclopedia. Vasari Life of Leonardo: in Lives of the Most Eminent Painters, Sculptors, and Architects. The true face of Leonardo Da Vinci?